Work continued after the winter break. 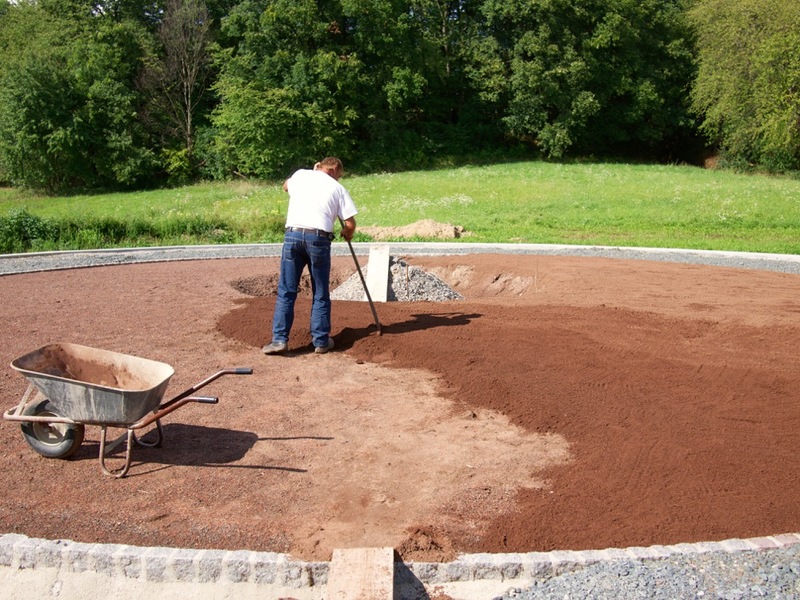 I now work together with the gardening and landscaping company Zanitzer. The company consists of Walter Zanitzer (Ferdl) and Freddy Thom. By now, I consider both my friends; after all, I only had a certain vision that inspired the project, but neither the experience nor theoretical know-how necessary. My idea was to construct a large monument. As it turned out, my on-site assistance was necessary for the realization of this vision. Direct contact with the workers – who both worked as their own supervisor – was necessary. The situation called for a healthy dose of improvisation. Many decisions were made directly on-site. The entire construction of the monument turned into an improvisational piece, performed by three free spirits: Zanitzer, Thom, and me. The concrete surrounding the steps was removed. In other words, a hammer drill was used to remove all concrete protruding over the steps. 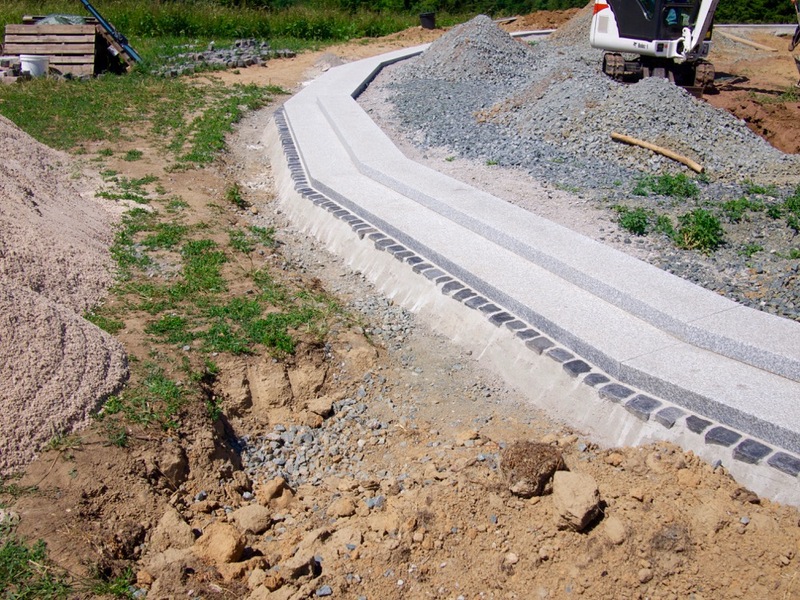 Basalt cobblestones were used to create the edging. We managed to buy used cobblestones, which had an attractive, worn surface. The edging has been placed with a steep concrete wedge (later no longer visible). Things look less orderly than before the winter break inside the circle. The gravel (mineral concrete) had to be partly removed again to construct the inner circle, which demarcates the crown of the Tree of Life. 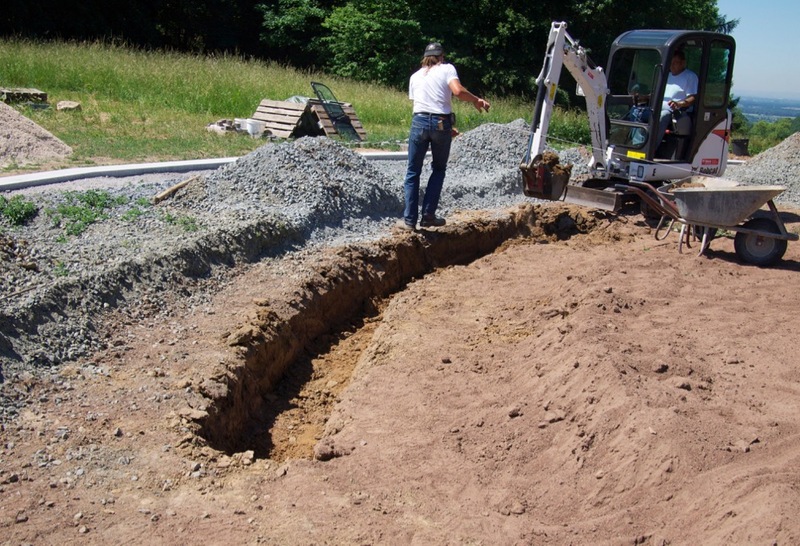 Freddy digs a narrow trench for the grey and red granite stones that will make up the inner circle. 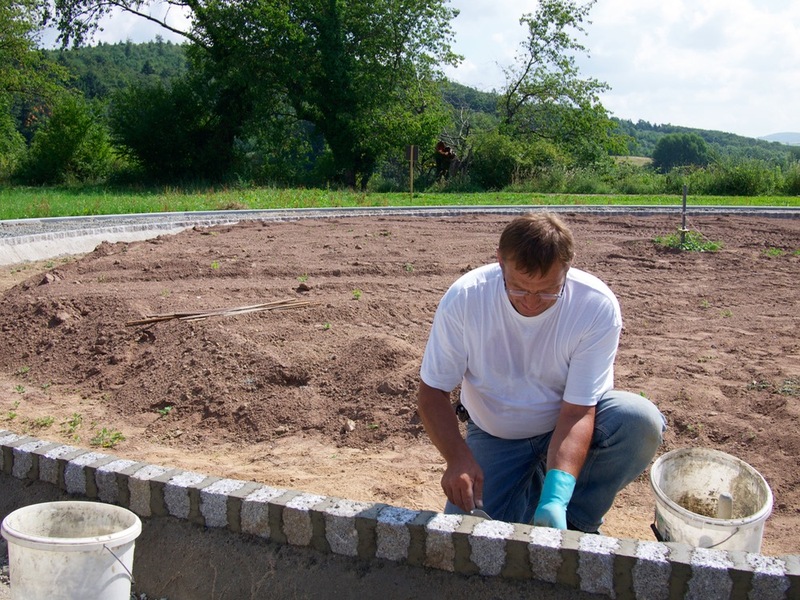 Ferdl sets the stones in concrete for a good hold in the soil. 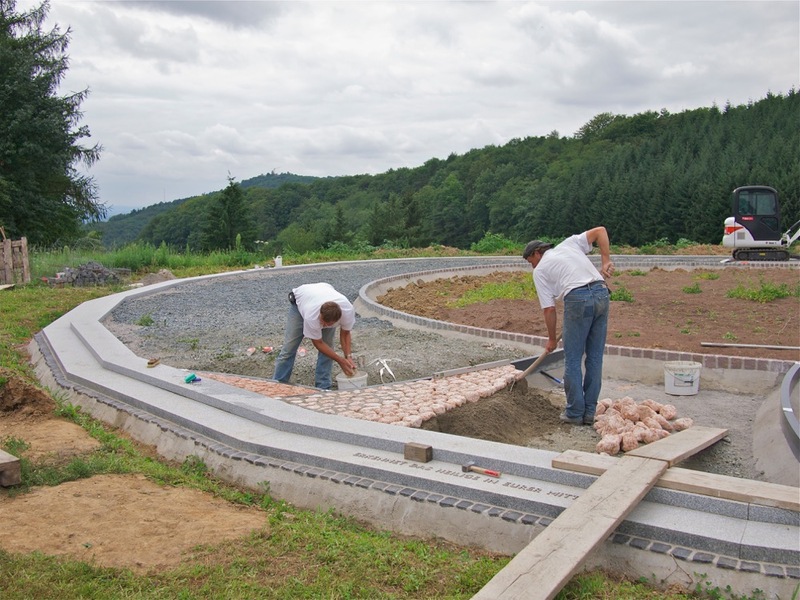 The stones have been placed in sets, with alternating sets of 48 red and grey stones. 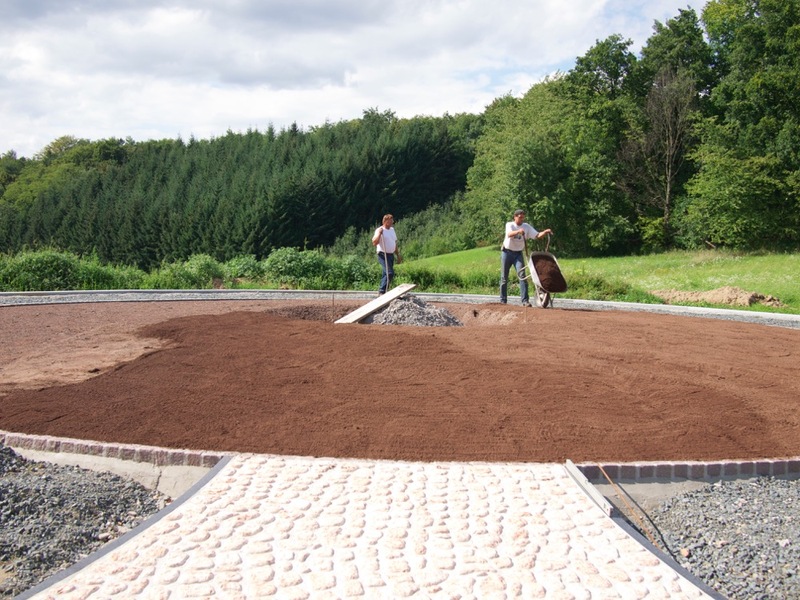 The inner circle has been composed of 8 x 48 = 384 stones in total. 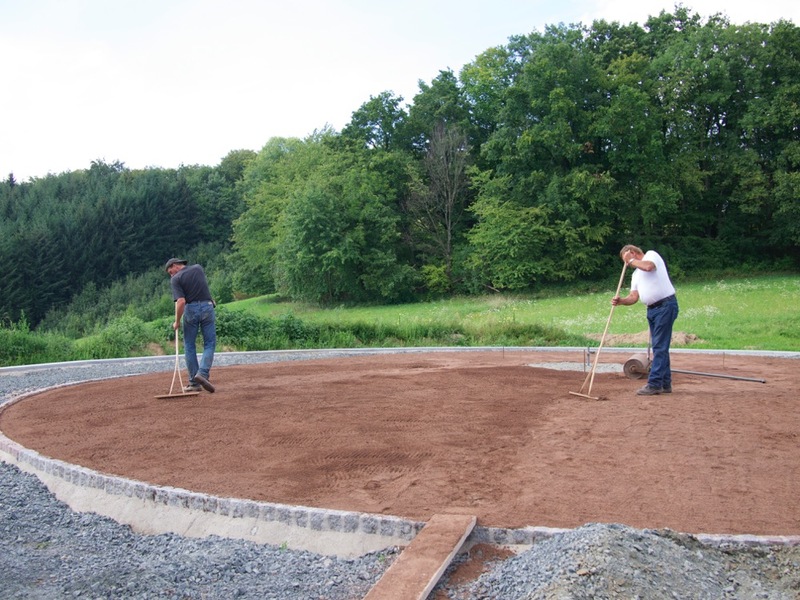 A lot of attention was paid to the placement of the stones, which were not just placed until they formed a full circle. Ferdl had to adhere to the exact dimensions to allow for this order. In the Bible, the 8 represents regeneration, 48 regeneration in the material world, with its cross sum 12 representing the “totally formed” and 3+8+4 = 15, or Yod+He, the first two letters of the Tetragrammaton. This is about the possibility to encode information in numbers, and not to a certain esoteric, magical function of numbers; it's art. The orderliness of the granite header stones catches the eye. These stones, with these orderly shapes, cannot usually be purchased. A large stone trading company in neighboring Heppenheim provided them to me. I was, by way of exception, offered the opportunity to select fitting stones for the monument from a selection of several thousand stones. 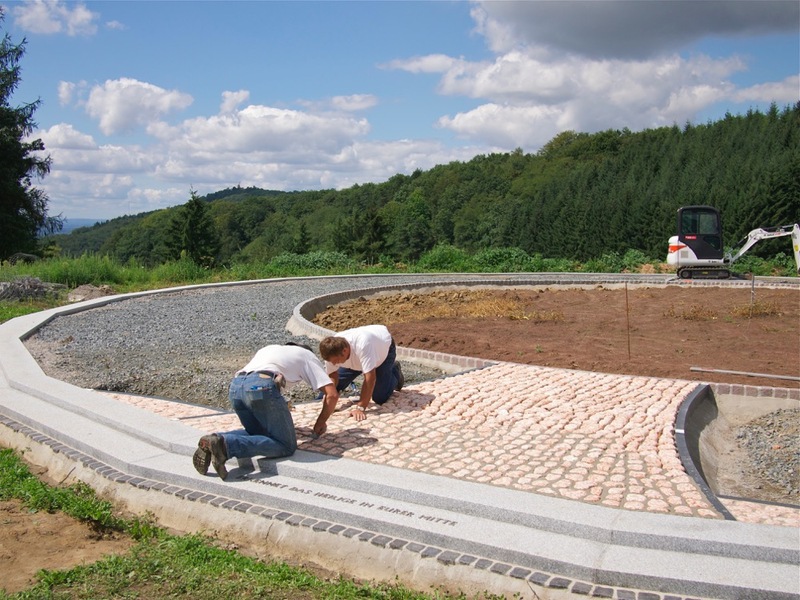 This inspired me to drive to Heppenheim every day for a few weeks, to empty their large crates full of stones and select “my 384 stones” from the large selection of over 4,000 stones. I returned the other stones to their crates. This company truly cares about improvisation artists. 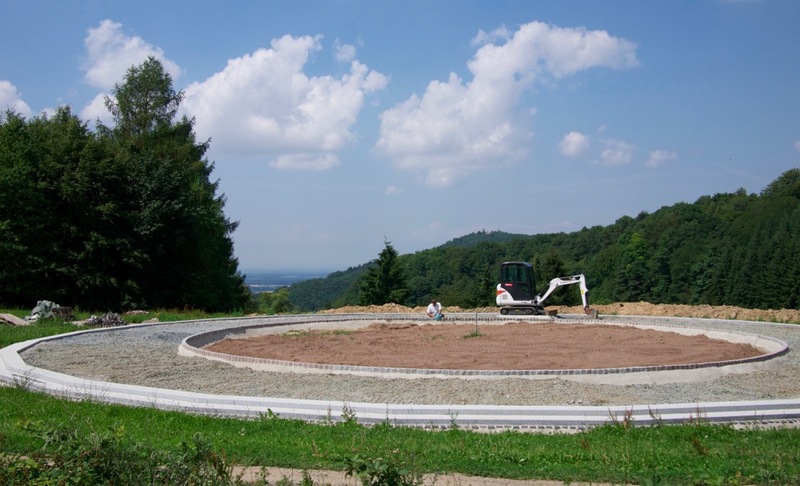 ;-) After selecting them, I transported the stones to the monument in Hochstädten in my small car, which could only transport a certain weight, again and again. 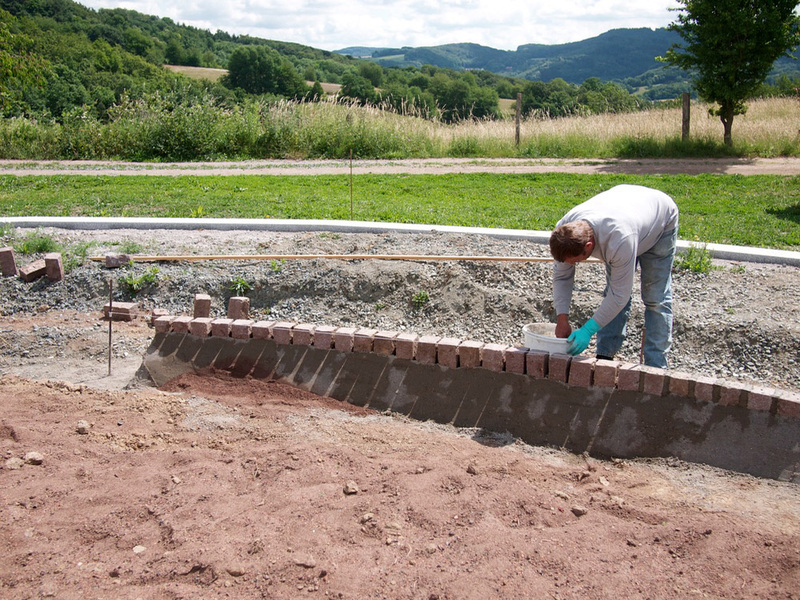 Ferdl fills the joints between the header stones. The inner circle that forms the crown of the Tree of Life has been completed. 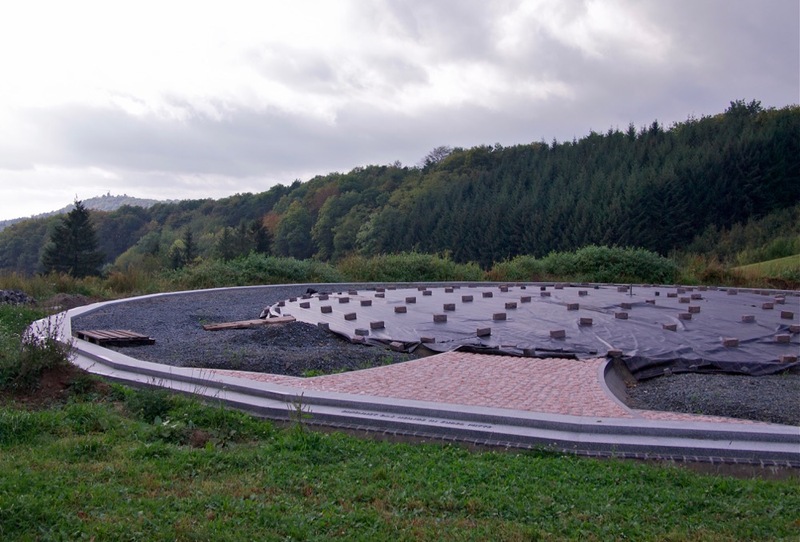 The gravel (mineral concrete) has been redistributed over the ring for an orderly look. 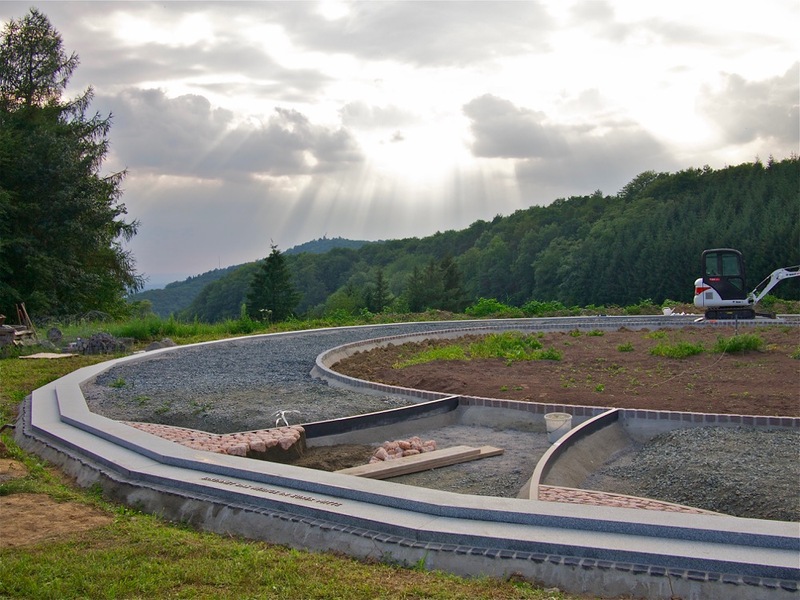 I commissioned the company Kurz Natursteine with the construction of the arches. They are made of black impala granite. To calculate the dimensions i had used a computer software. But a computer-controlled waterjet cutter could not cut the height of the arches. This meant that I could not use a computer file for giving the exact dimensions to a computer-controlled machine, which is why I created paper templates at home using the software and then I drove to the Kurz Company many times to draw the sawing lines on the stones using a white marker, after which the stones were sawn to shape. I made a bet with the brother of Oswald Kurz – who also worked for the company and was responsible for daily operations. He postulated that the stone arches sawn to size following my specifications would not fit in the monument. It would be impossible, as it is virtually impossible that the exact dimensions – as calculated using the design software – were adhered to. However, Mr Kurz was shown to be wrong, and I won the bet. 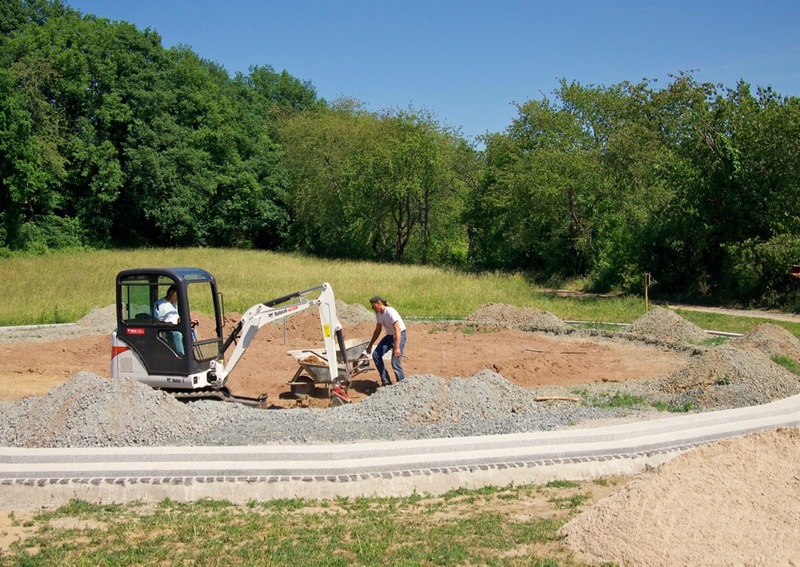 The stone arches were delivered and fit precisely into the ring prepared for them. 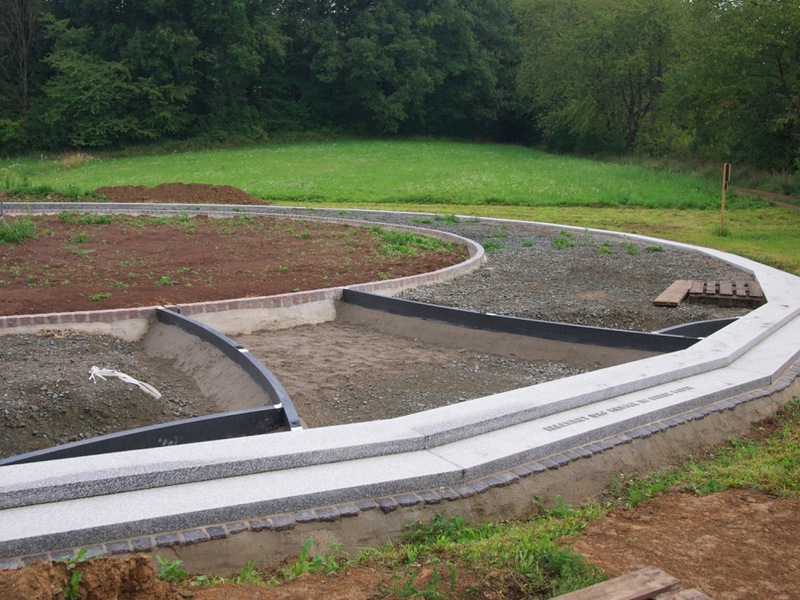 In the end, we constructed a monument with a width of 26 meters and a tolerance for error of only millimeters, instead of centimeters. I later learned that this is not exactly common practice for large constructions in the landscape. The trunk has been created. The concrete wedge used to fix them into the ground can be seen at the sides of the impala granite arches. The granite arches have been filled with tumbled onyx marble pebbles. In my vision, this could replicate a natural trunk. It’s clear for all to see that the idea works. I found the attractive onyx marble at the Badische Terrazo Handels-Gesellschaft near Karlsruhe. The other pebbles used for the monument were procured at the same company. I often visited them to buy stones and transport them back to the monument in my small car. 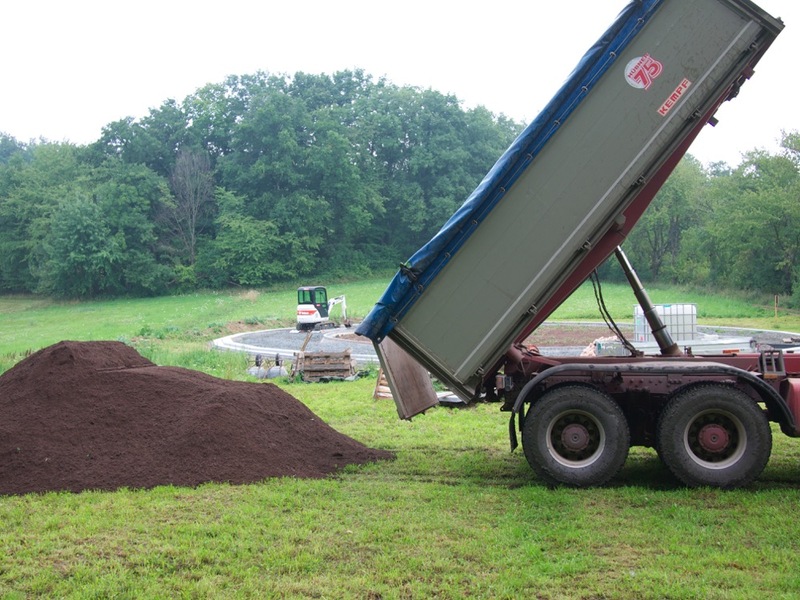 The soil has been delivered. It will be used to model the crown of the tree in the inner circle, which shall be slightly vaulting. 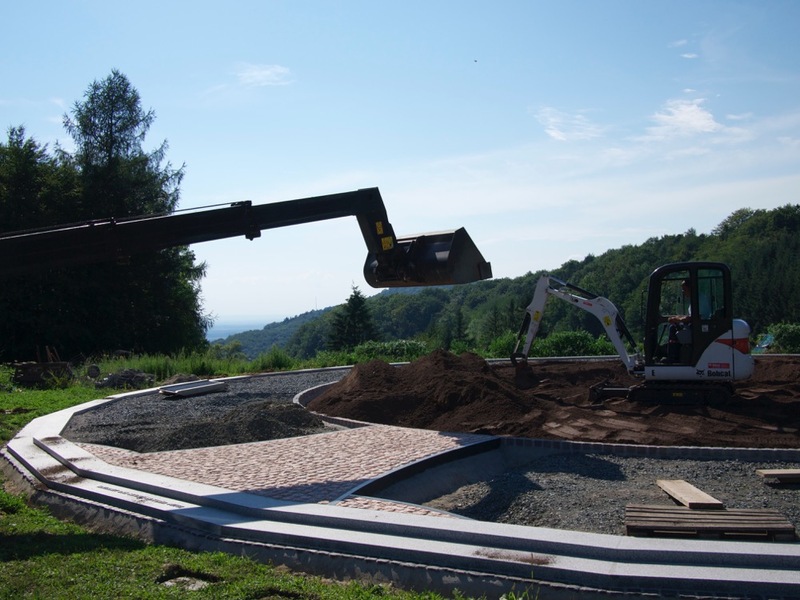 We rented a special digger to transport the soil to the inner circle. Freddy and Ferdl model the vault of the “crown”. The vault starts to assume its shape. The center is left empty for the Rose of Shalom. The modeling of the crown is in completion. The vaulted surface in the inner circle, which represents the crown of the tree, has been protected from climatic influences on October 10.